Turkey says it scrambled two military jets to chase away an Israeli plane which allegedly violated the airspace of Turkish-held northern Cyprus. A statement from the Turkish military says two F-16 jets were used to force the Israeli plane to leave the area. An Israeli military spokeswoman told Reuters they were checking the report. Relations between the two countries deteriorated after Israeli forces killed nine Turkish activists in clashes on an aid flotilla in 2010. Israeli forces had boarded six ships which were trying to break a blockade on Gaza and deliver aid directly to the Hamas-ruled Palestinian territory, instead of via Israel. Israel refused to apologise and as the diplomatic crisis escalated Turkey cut military ties with the Jewish state and expelled Israel's ambassador. The latest incident happened on Monday but information has only just been released. The Turkish military said the Israeli plane violated its airspace five times for a total of eight minutes before it was chased away. 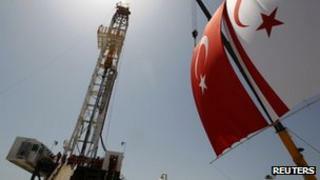 The situation is further complicated by the Greek Cypriot government's discovery of huge offshore natural gas deposits. Turkey is questioning who has the right to develop these reserves, and has dismissed a Cypriot-Israeli deal demarcating their maritime borders.